Alan and I started this project on April 8 by agreeing to a truce of “no arguing during wallpapering”. Stripping wallpaper, patching cracks, painting woodwork and ceilings, wallpapering and re-wallpapering – We are getting to old for this! Re-wallpapering? 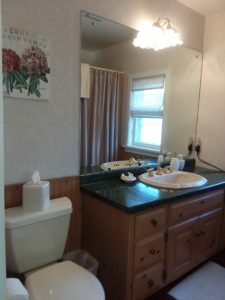 Yes, you heard that right, we had the bedroom done and moved onto the bathroom. Anyone who has done wallpapering knows that doing a bathroom is not an easy job. I had selected a different pattern for the bathroom, and when we were 3/4 of the way done I said, “I don’t like it”, which has never happened before in my decorating history. However, I have to admit, Alan was very accommodating. Off came the bathroom wallpaper. The paper I had selected had a vintage Paris feel to it. I selected this paper because Winnie, who the room is named after, had a “French Connection”. She was a junior at UW – Madison in 1932 when she came home with her French professor William J. Boning announced their engagement on Friday evening, married on Saturday morning and left for Paris, France on Sunday. The room is complete and turned out great minus the vintage Paris wallpaper! 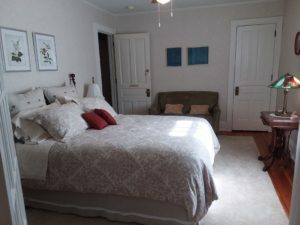 Guests have commented, “This room has a relaxing and calming feel to it”. 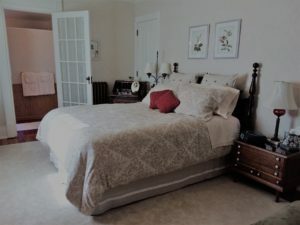 Give us a call at the Red Forest Bed and Breakfast, ask for “Winnie’s Room” and learn more about this matriarch of the Lohman family; she has quite a story to tell!